Use the Transactions pie chart to see a breakdown of your transactions into income and expenses, or into categories. The Transactions pie chart allows you to see a breakdown of your transactions into income and expense or categories. 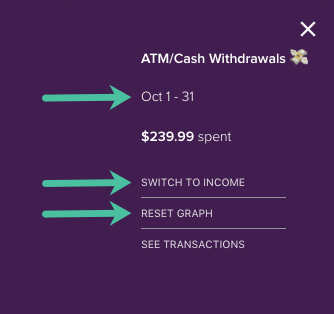 The data in the pie chart can be based on any option from the sidebar on the Transactions page (for example - All transactions or a particular account or category), or a transactions search. 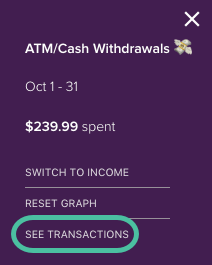 Select the pie graph icon on the top of the Transactions page ( Accounts > T ransactions). By default the Transactions page will display all transactions. The transactions pie chart allows you to easily drill-down into sub-categories. However, it's not possible to go back a step to the category above once drilled down. You will need to reset the graph and drill back down again.